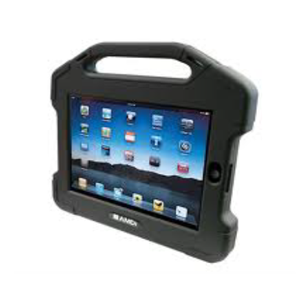 Protect your iPad 2 with this protective housing. Complete with rubberized corners, a small slide cover, and amplified speakers, you will not have to worry about damaging your iPad. More importantly, the iAdapter 2 is also an amplifier with dual speakers that will deliver clean crisp sound that can be heard in the noisiest of settings turning your iPad 2 into an effective AAC device. It comes with a rechargeable Lithium-Polymer battery, shoulder strap for portability and a plastic stand for table top use. The front and rear cameras are taken into consideration with iAdapter 2.